So many Pho's but so little time. Menu selection the best options presented within such a small restaurant. Enjoyed the pork option and coffee with condensed milk for quick lunch. Definitely will have to return for further dish comparisons when traveling Jersey shores. Service was quick and attentive with reasonable pricing. 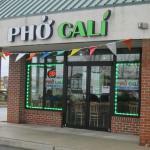 Been to Pho Cali? Share your experiences!